Tabasko is a Vancouver-based Salsa orchestra performing original compositions and arrangements of popular Salsa, Cumbia, Mambo, Merengue Bachata and Rhumba. Tayybeh is an award winning catering group supporting Syrian women chefs in Vancouver. They cater a rich menu of authentic Syrian recipes which they will serve as a buffet with meat, vegan, vegetarian, and gluten-free options abound. Door prize, silent auction and more…stay tuned! Tickets include admission and buffet dinner. Drinks available but not included in the admission price. Sponsor a ticket: $50 – Sponsor a ticket to ensure that admission is not a barrier to attending for some of our clients, members of the community, and students. Once sponsored tickets become available they will be distributed on a first come, first served basis. – Wheelchair access through the back. 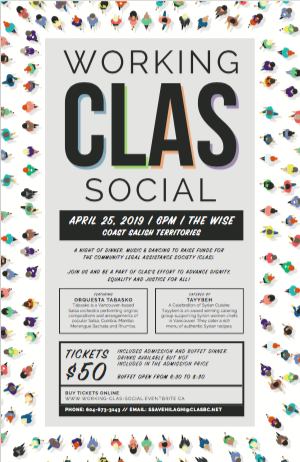 – To ensure that we can make this event as accessible as possible, please contact us with requests or access needs by calling 604-673-3143 or emailing ssavehilaghi@clasbc.net.